For the past 35 years, Scdoris has been giving folks a taste of the traditional Alaskan life that loomed so large for him as a child—namely contact with the breed of dog he’d read about, Alaskan huskies—by way of Oregon Trail of Dreams, the sled-dog touring and racing company he founded in the early 1980s and operates in central Oregon. Scdoris, along with his daughter, world-class dogsled racer Rachael Scdoris, owns more than 100 huskies and runs nearly 900 sled-dog tours a year on the slopes of Mount Bachelor. Last winter, he took his forty thousandth guest on a dogsled ride. But it took some time before that Portland schoolboy caught up with his dream of running a sled-dog team. After a stint in the army, Scdoris attended the UO and earned his degree in community service and public affairs. In 1975, he moved to Gold Beach on the southern Oregon Coast to launch a career working with disabled people. It was here that he first laid eyes on a team of Alaskan huskies. “One morning, I saw a man running a dog team on the beach,” he recalls. Scdoris approached the man, who gave him both advice about building his own wheeled dog cart and a free husky. “A beautiful dog,” says Scdoris. He paired the gift with an “athletic mongrel” he already owned, then rounded out his first dog team by several visits to the pound. “Within six months, I had eight dogs,” he recalls. There was only one crucial sled-dog racing element notably missing in his life on the Oregon Coast—snow. In early 1979, Scdoris moved to Central Oregon, where snow can fall from October to June. He bought a 40-acre spread in a rural community called Alfalfa near Powell Butte, and began building a life around sled dogs. 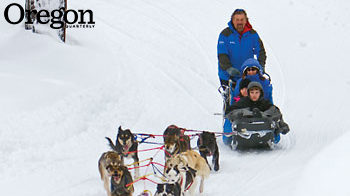 In the winter, a typical Trail of Dreams tour traverses a six-mile trail behind a team of 8 to 12 dogs. In the summer, visitors hold on tight in wheeled carts cruising along at 25 miles per hour. As the business grew, Scdoris also began to enter—and win—sled-dog races in the Pacific Northwest. At about this time he became a father. Rachael seems to have gotten something besides a bumpy nap from those early dogsled rides. “She didn’t know it and I didn’t know it, but she was a sled runner,” says Scdoris. At 11, she entered her first race—and was hooked. Scdoris divided his time between racing (both he and Rachael were actively competing) and managing his year-round business. Even with her visual limitation, Rachael proved herself a winning competitor from the start. Trouble began, however, when her success put her in position to move from novice to pro. Race officials, her father says, were suddenly convinced that the sport was way too dangerous for a blind person. Father and daughter walked away from the Pacific Northwest sled-dog circuit. But in 2000, Scdoris received an unexpected call from the director of the International Pedigree Sled Dog Race in Wyoming; he’d heard Rachael hadn’t been allowed to race and welcomed her to compete in the Pedigree. Scdoris laughs at the recollection. “I said, ‘Your race is 500 miles long! The longest she’s ever raced is 25 miles.’” Scdoris knew firsthand the challenges of the Pedigree course; in 1997, he entered and failed to complete the punishing race. But Rachael jumped at the opportunity. Not only did she finish the Pedigree race, she also discovered that by doing so, she’d completed one of three qualifying rounds for the ultimate sled-dog race, the Alaskan Iditarod. She soon entered and finished the other two qualifiers. This time, however, Scdoris and daughter had a serious backup crew—their cause brought forth legal champions of the Americans with Disabilities Act and the American Civil Liberties Union, not to mention Nike and other major sponsors. 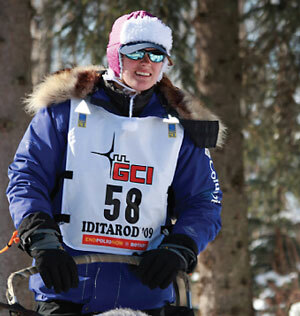 The Iditarod officials caved, with the caveat that Rachael race alongside another team, to assist and ensure her safety. “It was the fulfillment of a dream and the realization of that old cliché about being careful what you ask for,” says Scdoris of the 2005 race. The epic, 1,150-mile marathon is infamously grueling—howling winds, long durations of darkness, a treacherous course, and temperatures frequently below zero. Scdoris was beside himself with anxiety, awaiting news from each successive checkpoint along the course. “I’d stumble through the day in a haze, waiting for an update.” Eventually he received word that Rachael’s dogs had become sick around mile 759. For her, the race was over. Until the next year. During that race, Scdoris was again “completely worried,” even though the addition of a GPS device meant he could continuously monitor Rachael’s progress. This time, she finished. In 2009, she raced again, placing forty-fifth overall and achieving her best time yet, about fourteen and a half days. Neither daughter nor father is sure when Rachael will race the Iditarod again. Entering and running the race costs $55,000 for Rachael and $40,000 for the second team that accompanies her—a cost offset by sponsors but still ultimately underwritten by Oregon Trail of Dreams.